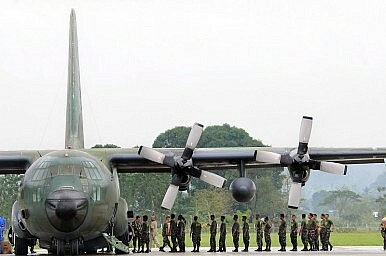 The Philippines will modernize its air force by 2016 President President Benigno S. Aquino III said on Monday, local media reported. “Be assured that before I step down from office [in 2016], our skies will teem with new and modern equipment such as lead-in fighters, long-range patrol aircraft, close air support aircraft, light lift fixed-wing aircraft, medium lift aircraft, attack helicopters, combat utility helicopters, air defense radar and flight simulators,” Aquino said in a speech marking the 66th anniversary of the founding of the Philippines Air Force. Noting that since taking office he has allocated US$648.44 million to modernize the armed forces, Aquino said that the passage of the New Armed Forces of the Philippines Modernization Act last year allocated around US$1.73 billion for that purpose over the next five years. Its prior modernization of the armed forces had been passed in 1995. In January the Philippines announced it would purchase 12 FA-50 fighter jets from South Korea, ending an eight year gap in which Manila did not possess any fighter jets. The Philippines retired its US-designed F-5 fighters in 2005. At the time of the announcement, the Philippine government said it had budgeted $464 million for the new jets. Last month there were also reports that the Philippines would seek to purchase missile defense systems from Israel. Aquino’s announcement on Monday came amid the backdrop of rising tensions between the Philippines and China over the South China Sea. Back in May, Manila accused China of sending three ships within 5 nautical miles of the Second Thomas Shoal, a disputed reef in the South China Sea where the Philippines maintains a small Marine contingent. Last week, China threatened the Philippines with a “counterstrike” over its actions in the disputed waters. Then, at the ASEAN Regional Forum this weekend, Philippine Foreign Minister Albert del Rosario warned of China’s “growing militarization” of the South China Sea. Beijing rebuked Rosario, with Xinhua News Agency charging instead that “It is… the Philippines that has been continuously undermining the stability of the South China Sea and increasingly militarizing the region.” To back up this claim, Xinhua cited a recent military drill the Philippines held with the United States near the Scarborough Shoal, as well as the Philippines announcing that it was considering giving the U.S. and Japan greater access to its deep water port at Subic Bay. As part of its annual drill with Washington last week, the U.S. troops trained their Filipino counterparts in how to operate surveillance drones. The training utilized the miniaturized "Puma" drones, which are not suitable for lethal operations. On a more positive note, at the ASEAN Regional Forum last weekend China agreed to hold "official consultations" with ASEAN on a proposed legally-binding Code of Conduct (CoC) to govern states’ actions in the South China Sea. The parties will hold a foreign ministers meeting in September to discuss entering into negotiations. At the same time, China warned that such negotiations would be contingent on all parties meeting their obligations under the non-binding Declaration of Conduct in the South China Sea, which Beijing accuses Manila of violating. China also emphasized that the South China Sea issue should be solved only by the parties directly involved in the dispute. In the past, Beijing has preferred bilateral negotiations where it holds the upper-hand over its smaller neighbors. Zachary Keck is assistant editor of The Diplomat.